I just arrived from Hong Kong last weekend to attend the American Express Wine & Dine Festival which opened last October 31. I was part of the VIP group lead by OpenRice Hong Kong that got to explore the venue before it officially open its door to the public. It was really a surreal experience and I am still excited and very much thankful that I got to be a part of the very first OpenRice International Event with winners coming in from China, Malaysia, Thailand, Singapore, Taiwan, Indonesia, Hong Kong, and of course- The Philippines. Flashback: Sometime in August, OpenRice Philippines announced a food review contest and that the winners will get to attend the Wine & Dine Festival in Hong Kong, airfare and accommodation included. Wow! Too good to pass up the opportunity. However I didn't expect to win because I know that there are a lot of openricers and I am just a new member. But then the unthinkable happened- I was told that I was leading in the contest. And it was really amusing because I really didn't know that there's a score board until a friend mentioned it and sent me the link. Then half-way into the contest, I got sidetracked with errands and other stuff and the next thing I knew, someone overtook my lead. Oh no... panic time! Well, not really because I was really that busy that writing food reviews for the contest will take a lot of my time and will keep me from doing my errands. But hubby and daughter are cheering and prodding me to finish where I left off. Aja !!! There was suppose to be three winners from the Philippines but due to some unforseen events, only two of us flew to Hong Kong last October 30. We only got to text each other the day before our flight and met inside the plane. I was supposed to join him and his friends up to the hotel but I got sidetracked in the cockpit. Then there's a lot to see inside the airport especially the shops that sells food- yum! I was feeling hungry after checking most of the shops inside the airport that I hurriedly returned to Maxim's. I love bread and the ones on display are all so enticing. They're calling my name and waving to me- eat me, eat me, bite me, bite me. 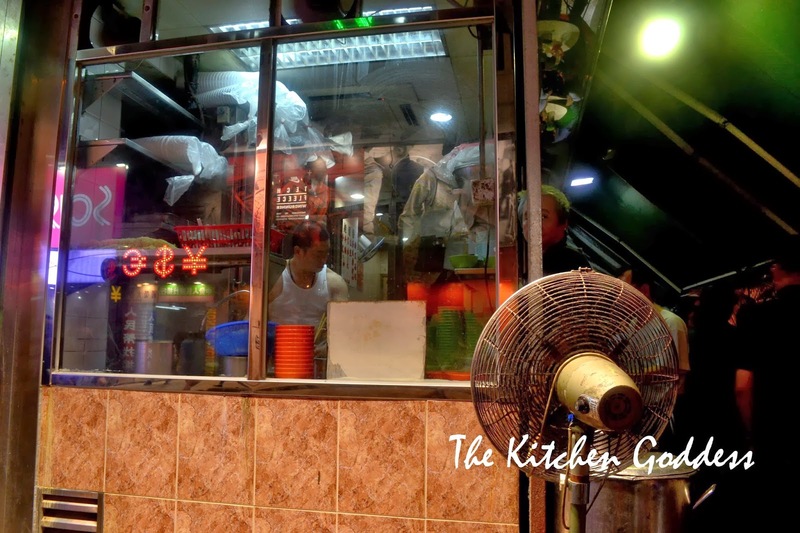 The staff are very friendly, too and that's a plus factor for me since I am travelling alone. Everything looks delicious but since I want to stretch my allowance, I chose the cheapest ones that costs hkd$6-7. I got a chocolate bun, a sugar bun and a pork bun (this one's more expensive at hkd$12). I have two words- super yummy! The only downside was that I bought a bottle of water in this store that costs hkd$15 because I was really, really thirsty. Then I saw a nearby 7-11 and a bottle of water there costs about a quarter of what I paid for. Oh well, lesson learned. Took the bus up to the hotel. Lucky me, bus stops a few steps away from the hotel. Had a nice and refreshing nap before I decided to go to IFC Mall in Central. 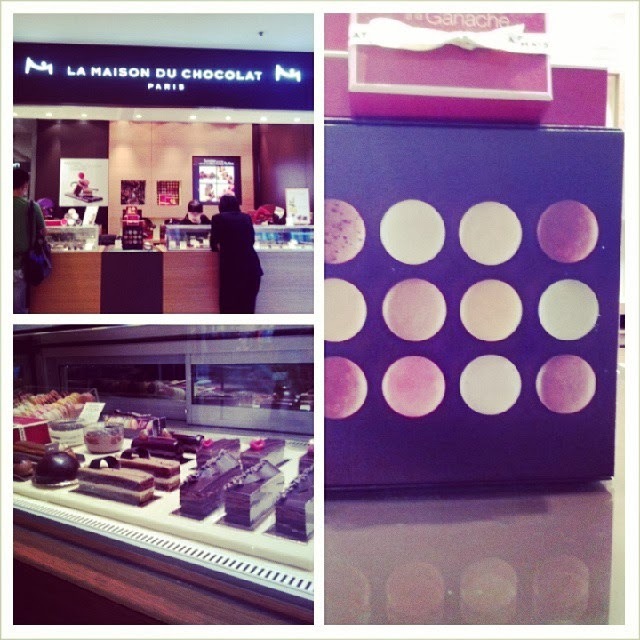 Can't help but drool over La Maison du Chocolat. Everything looks so yummy and expensive. A work of art! Super worth it even if its super expensive. Will write a separate blog entry about it soon. Then I had a long stroll towards the pier where I espied a store that sells interesting goodies. Note to self: buy some of these goodies before going back to the hotel. I ended up at the ferry (not really surprising) so I decided to cross over to the other side. That's in Tsim Sha Tsui area. The ferry's actually cheap at hkd$2.50. Last ferry going back to Central is at 11pm so I need to remember that. 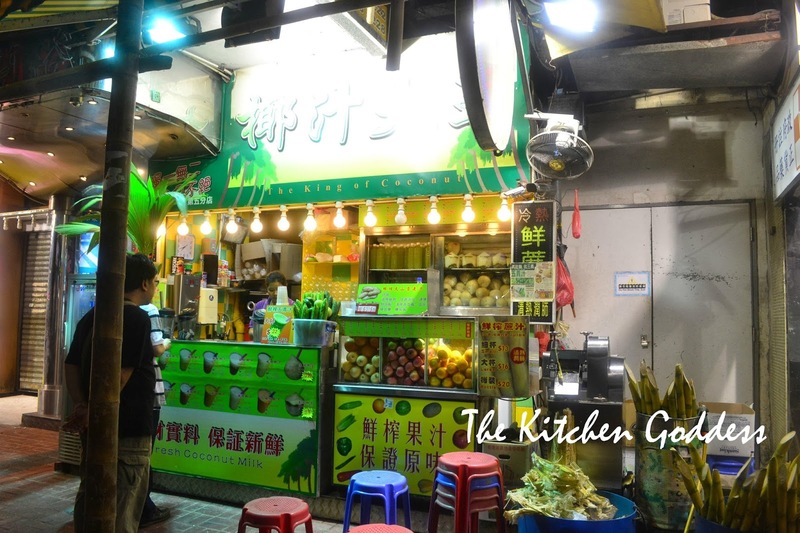 Although there must be numerous restaurants in Tsim Sha Tsui, I only entered the shops that doesn't sell food. Haha. Anyways, I still have a lot of time to explore so I hopped onto another bus going to Mongkok to check out the night market. Its really easy to go around sans map. All you have to do is ask a passerby or a policeman. 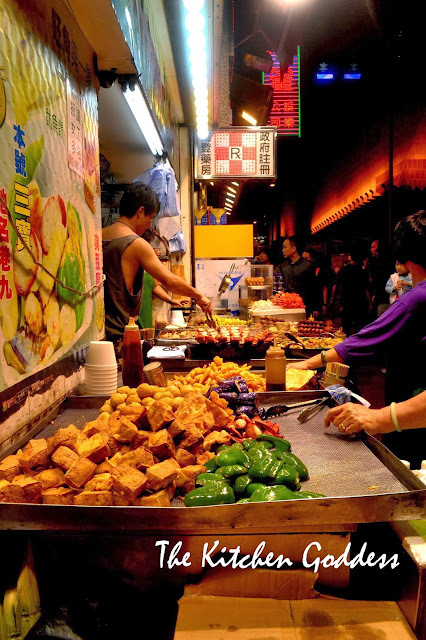 Mongkok is a much more busy district compared to Tsim Sha Tsui and the stores there are relatively affordable. 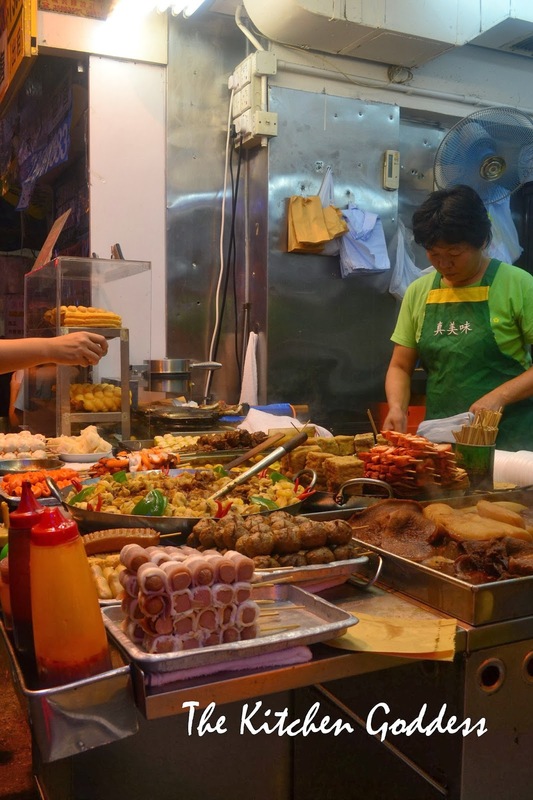 Not to mention the numerous food stalls and other hawkers and street performers. This is my first food stop in Mongkok. I just followed the people in front of me and ended up in this food stall. Also, plus factor is the long queue. Thumbs up for the fried tofu. Costs hkd$12. The man sliced it up for me and place it in a cup. Then I just added some sauce and black vinegar. 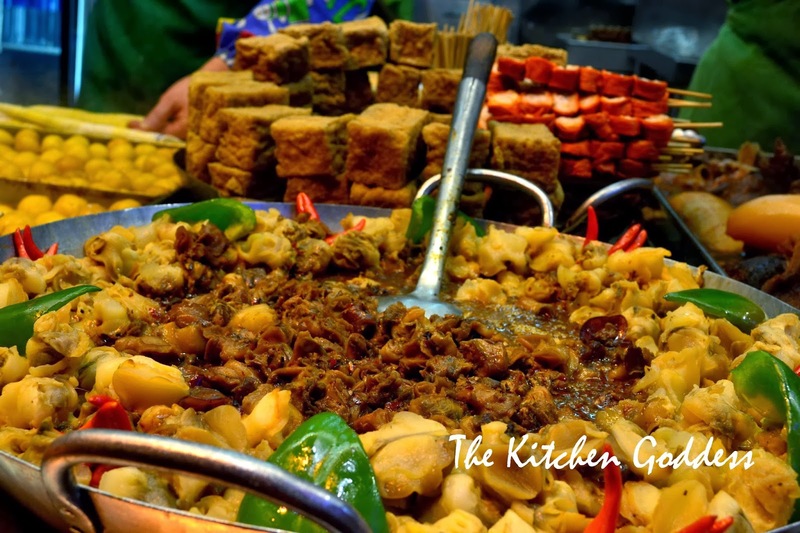 Next food discovery is not for the faint-hearted. 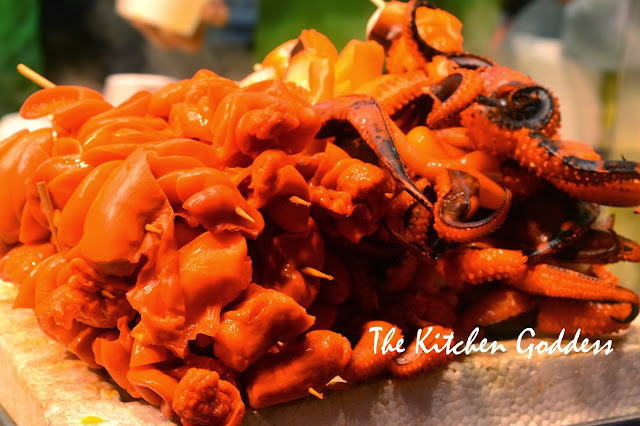 Orange-y grilled intestines and Octopus tentacles. I had both. Too interesting to pass up. Not bad and its literally chewy. Its like the jumbo version of our local "isaw." Damage to wallet is about hkd$30. Had a nice time sightseeing until I ended up in another food stall with a much longer queue. Went overboard here. 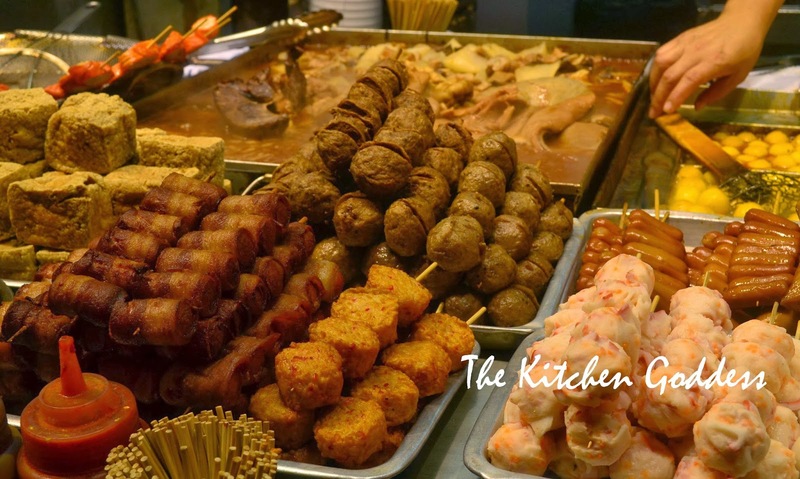 Had crab cakes (well, it looked like the crab cakes sold here in Manila), the sausage, shrimp balls. Actually, I don't really know what I'm eating since the seller doesn't speak English. We just communicated by "sign" language (I just point and the seller nods her head). I wanted to taste more but I'm too full. Tastes great, by the way. Hurray for Mongkok street food! I just bought a bottle of water when I saw this store that sells sugarcane juice. Oh my, this reminds me of the sugarcane juice sellers in Ongpin. I know I should've waited for a table but I want to explore further and experience not only the taste but the sight and sound of Mongkok as well. Alas, my feet led me to another food stall. Hahaha. I controlled myself this time and just had a stick of yellowish innards. It was placed inside a paper "supot." My order didn't excite me at all. Or maybe I'm just too full. Bye bye hkd$15. 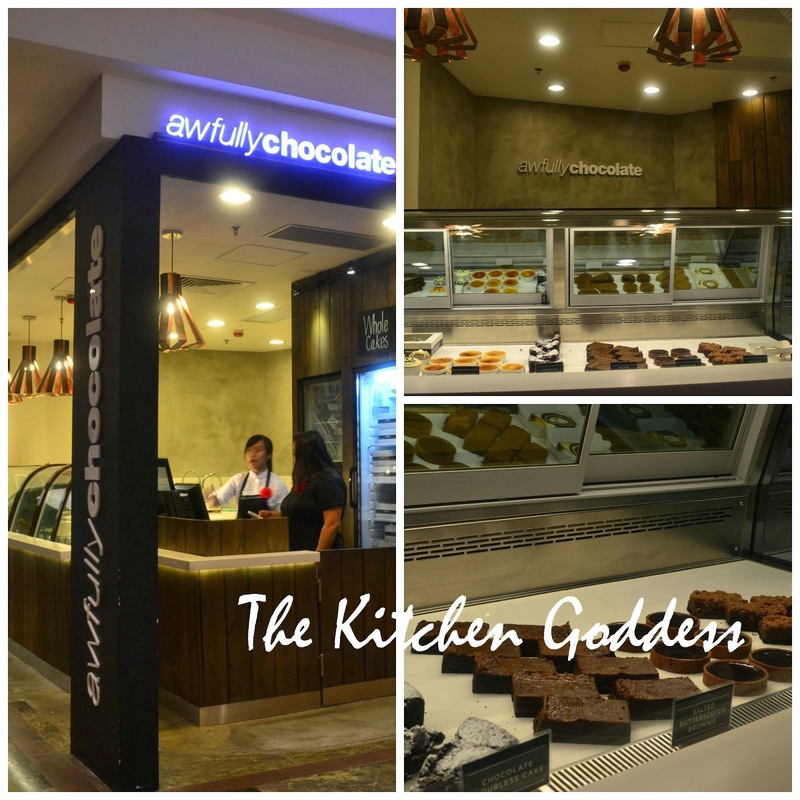 So after being disappointed with my last street food discovery, I went to the nearby mall to check some clothes but a foodie is always a foodie because I saw this yummy looking shop that sells brownies. Its called Awfully Chocolate. Can't resist even if a piece costs hkd$48. Ouch! But nevermind the hole it created in my pocket- I had the salted butterscotch brownie. I think I just died and went to brownie heaven! I decided to head back to the hotel after brownie heaven. Besides, I don't want to miss the ferry. After the ferry ride and the long bus ride back to my hotel, I was lured by 7-11 and bought some goodies for my midnight snack. And look at what I found in 7-11, Roller Coaster Abalone flavor by Jack n Jill. Jack n Jill is a familiar brand here in Manila. Although this flavor is not sold here, buying this made me a bit homesick. Well, just a teeny tiny bit. And I paired it with this uber delicious milk, also from 7-11. Then I found some leftover sugar buns. Happy camper. I made a quick trip to McDonald's after my ferry ride before riding the bus. I bought Fillet O'Fish and Fries. Sorry, can't resist this familiar fastfood favorite. No photos though. I ate it inside the bus on my way back to the hotel. When we went there, the streetfood were tempting, but I had to pass as I was too scared to have a bad stomach, that in turn might ruin the trip. Next time i will, haha.